Port Elizabeth - An astonishing day of runs and wickets from the Proteas left New Zealand in tatters at the end of the second day of the second Sunfoil Test match at Axxess St.George’s on Saturday as the tourists closed on 47-6 in reply to South Africa’s huge total of 525-8 declared. Faf du Plessis and Dean Elgar added centuries to the one Hashim Amla made on day one before Dale Steyn, Rory Kleinveldt and Robin Peterson claimed a pair of wickets each to set up the possibility of a second successive three-day victory for the home side. Amla added just four runs to his overnight 106 before edging a leg-side delivery from Trent Boult to wicketkeeper BJ Watling but there was precious little else for the New Zealanders to celebrate as Du Plessis and Elgar added 131 for the sixth wicket in good time. Du Plessis reached his century with a six, as he did to reach 50, and took his second century in just his fourth Test to 137 from 252 deliveries with 14 fours and the two sixes before top-edging medium-pacer Colin Munro to cover. Graeme Smith delayed his declaration until after tea to allow Elgar the opportunity to score the nine runs he needed for a century in just his third Test which emphatically erased the memory of the ‘pair’ he made on debut in Perth last month. The Chevrolet Knights’ left-hander discarded all the tension and diffidence he displayed in that game, and again at Sahara Park Newlands in the first Sunfoil Test, to bat with the freedom and confidence which produced a six and 14 fours, the last of which saw him move from 99 to 103 from 170 deliveries. 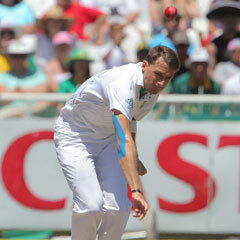 Steyn made immediate inroads when a weary New Zealand finally began their reply after 153.5 overs in the field. Opener Martin Guptill edged to third slip where Alviro Petersen obliged and Kane Williamson followed in the great fast bowler’s third over, caught by Smith at first slip. Kleinveldt produced a snorting delivery which Dean Brownlie could only glove to AB de Villiers and then promptly trapped Daniel Flynn lbw for a duck. If the tourists were hoping for some respite at the introduction of Robin Peterson into the attack, the opposite transpired as the left-arm spinner claimed two wickets in as many balls. Brendon McCullum nicked a wild drive into Kallis’ midriff at slip and Colin Munro, who bowled so tidily on debut, inside-edged his first delivery to Elgar at short leg to complete another day of wretched misery for the tourists.